Wine and food loving wine-pages visitors have helped me flesh-out details of the best places if holidaying in the Tuscany area. On my last trip to the region I enjoyed a visit to the Radda in Chianti estate of Terrebianca (tel: +39 0577 738 544). Terrebianca came to my attention with the 1993 vintage, when Robert Parker gave their moderately-price ‘Campuccia’ super-Tuscan wine 93 points. I ate really well in the countryside around Greve, south of Florence, but took no notes unfortunately! I do recall a couple of meals with particular pleasure however, absolutely top of the heap being Club Alessi, Via Di Mezzo, Florence (tel: 055 241 821). This is a private dining club, for which an annual membership must be purchased. It was well worth the modest fee however, to discover the extraordinary atmosphere and possibly the best cooking in Italy. The club is run by Guisseppe Alessi and his family, passionate philosophers of Italian cuisine who painstakingly create dishes based around the best local produce and according to ultra-traditional recipes. Slow-braised meats and soulful stews abound, and the noisy, crowded, joyful atmosphere is superb. Prices are also rock-bottom, making the membership fee even more worthwhile. Be warned, this is the most anonymous restaurant I have ever experienced, with no external signs, except short, good-natured crowds of Italian foodies waiting to step inside past the bustling open kitchen. My research suggests the Club may have changed its name to ‘La Pentola dell’Oro’, though it is still at the same address. The well-known Cantinetta Antinori in the Piazza Antinori is comfortable and also very good, though quite expensive for basically simple food. As it is owned by the Antinori estate, their wines feature prominently of course (tel: 055 292 234). Ali Downes: In summer 2001 we stayed for two weeks on a wine estate near Castellina in Chianti. Both weeks we had Sunday lunch in Trattoria La Torre (tel: 0577 740236) in the square in the little town. The Stracotta (rich Chianti based stew) was excellent as was the Papardelle a la Lepre (Hare sauce) and the Banfi Brunello de Montalcino to wash it down was perfect. One of the (several) Enotece, Le Volte (tel: 0577 741314) runs regular wine-tasting dinners in a local restaurant (Ristorante Albergaccio 0577741042 – no credit cards) and we decided to give one of them a try. Marco Mucciarelli who runs them speaks well in excellent English and obviouslyhas a good knowledge of Tuscan wines. We tasted three different wines then we got the next three blind to see if we could work out which of the first three each one was related to. There was another winefollowed by a meal of Tuscan specialities which included the local version of lasagne and boned rabbit stuffed with omelette and vegetables androasted. An informative and enjoyable evening and worth the 40 quid each. Other culinary highlights were Bistecca Fiorentina (huge steak for twopeople) at Trattoria La Toppa (tel: 0558 072900) in San Donato in Poggio and a selection of wonderful smaller dishes at Cibreo, Via dei Macci 122 inFlorence (tel: 234 1100). Also in Florence don’t miss the ice-cream at Via della Stinche (can’t remember the name of the shop but look for lots ofpeople with ice-cream tubs) – especially the remarkable pistacchio! Regis Mussolin: We were in Tuscany in Oct 2000. That might not be the best time of the year in terms of weather, but it is relatively quiet, prices are lower, and estates more available. The excellent book “The Wines of Tuscany” lists estates by DOC, with a description, address & phone. Also listed are the Enotecas (wine bar & shops) where one can buy wine as in any shop, but you can also drink some with a meal for a modest charge. Unfortunately there is no map in this book to help you find the various places. Heading south from Florence one comes to Greve in Chianti. In the central square, Piazza Matteotti, you’ll find Mangiando Mangiando (tel: 0558 546 372), a nice little restaurant serving delicious pastas. There is also a magnificent delicatessen with a breathtaking choice of hams & sausages. Still going south you will come to a really nice village called Panzano. On top of the hill overlooking Chianti, this is a charming and typical Chianti village. For those how can afford it, the Hotel Villa Le Barone (tel: 055 852 621) is of a very high standard. Everyone should stop at Enoteca Baldi in Piazza Bucciarelli (tel: 055 852 843) to have a bite and a bottle. There is a very good selection of wines, including some Gajas & even rare French wines. Bryan Collins: for serious foodies, Enoteca Pinchiorri in Via Ghibellina, Florence (tel: 055 242 757) is arguably the most famous restaurant in Italy – and their wine list is probably more impressive than the food, which is somewhat overly pretentious for my taste, although the guys at Michelin love it to bits. Richard Weaver: These are more rural – I stayed in the country outside Siena two years ago and had the best holiday of my life. 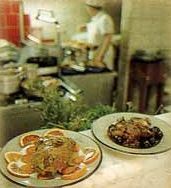 If you’re near Colle di Val d’Elsa and have a forgiving credit card, ‘Arnolfo’ in Piazza Santa Caterina (tel: 0577 920 549) was fantastic when I was there in 1999. There’s a brilliant menu gastronomica but it’s London prices all the way. The range of Grappa was unbelievable. Also in Colle, Antica Trattoria in Piazza Arnolfo (tel: 0577 923 747) is a bit more reasonably priced and has a good list of Tuscan wines. Sitting outside in the summer is fantastic. If you’re in the small hill town of Monteriggioni both restaurants will do you a great meal, provided you like boar and truffles. ‘Il Pozzo’ in Piazza Roma (tel: 0577 304 127) is particularly recommended for the porcini tortelli covered in butter and black truffle. Both had good wine lists. Bill Nanson: I visited Montalcino and Brunello in September 2001. Many ‘Enotece’ have wines open to taste, but might charge you 10,000 – 20,000 ITL to taste if you don’t buy something. Having returned home, I can see that prices are a mixed bag. Buying recent vintages of ‘middle-rank’ wines can be much cheaper from the producer than at home, often due to their supply agreements prices are the same in the local wine merchants as at the producers. The biggest differences are for ‘better’ wines, which are harder to find. Here they might be considerably cheaper in the UK if you can find some. One of the best things about eating out in Montalcino is that the £50 bottle you were fondling in the wine-shop is still only £50 in the restaurant – very little mark-up was obvious. The menus are similar in all the establishments, but quality varies a bit. I may have been lucky, as the worst quality I experienced was merely ‘very good’ but two restaurants were ‘outstanding’. The restaurant Taverna dei Barbi in Podernovi (tel: 0577 841 200) where we stayed was one, with a selection of the estates wines going back as far as a 1985 Reserva for 450,000 ITL or around £150 ! My favourite was Il Grappolo Blu in Montalcino centre (Via Scale di Moglio, tel. 0577 847 150). Beautifully cooked food and a really comprehensive wine list that includes many half bottles, so you can experiment. If you push the boat out and go for that £50 bottle, your meal for 2, including 4 courses, water, coffee & grappa will come to £80-90. Ali Downes: If you are serious about wine visits then buy Oz Clarke’s guide to Tuscany. It is full of information and recommendations including places to eat at ornear the wineries. Our best visit was to Dievole (which is in the wonderful sounding Vagliagli (val-yi-al-yi – meaning valley of garlic). Ifyou approach from the North off the Siena road be prepared to think you are lost – you probably aren’t. The winery has a restaurant serving lightfood (salami or cheese platters, carpaccio etc) which is a good way to start or finish the tour which takes about an hour. At several pointsalong the way you get a little morsel of food to taste with the wine and the guides seemed to know what they were talking about (my pet hate whenthey don’t!). Venturing further south to the Montalcino area we visited the large Banfi operation. Despite phoning a couple of days beforehand (tel: 0577 840 111) thetours were full so – plan ahead. We did however go to their shop where you can taste all the wines and where the lady serving turned out to be fromBirmingham. To our great surprise we ended up buying a bottle of Grappa as a result of her recommendation to try it – we had never been too impressedwith it on other occasions. Another wine we loved is Fonterutoli which is available for tasting in the local restaurant Osteria di Fonterutoli (good truffle sauce).Finally, if you are on the road from Poggibonsi to Castellina, stop in at Le Fioriae to sample their Chianti and Super Tuscan and tell Laura herScottish visitors sent you! Regis Mussolin: In Florence I recommend you to go at the “Piazza della Repubblica” were you’ll find a huge library. Among the wide selection of maps there is a very good selection of wine books in various languages. Going south toward Siena we stopped in Greve in Chianti, a very nice little town. Arriving in the village, the small wooden house on the left hand side of the road is the tourism office. It sells interesting maps of Chianti Classico with all the wine estates marked. At the far end of the central square there is ‘Enoteca del Gallo Nero’, Via C. Battisti (tel: 055 853 734) which has a very fine selection of Tuscan wines. 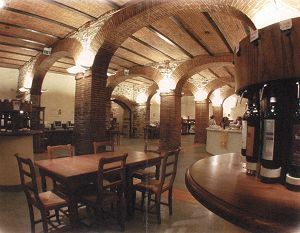 More like a ‘superstore’ is ‘Le Cantine di Greve in Chianti’, at Galleria delle Cantine (tel: 0558 546 404). This is an amazing wine shop with a huge selection of Chianti wines, as well as Brunello & Super-Tuscans. What I really liked, is that you can buy a ‘wine tasting credit card’ that allows you to taste what you want from at least 50 wines that are available at any one time. Simply insert you card in the display and select the wine you want to taste. Each tasting shot is debited according to the wine price (most Brunello being more expensive than Chianti for example). Once the card is empty you can have it topped-up. The atmosphere is great too, and in the vaulted basement there are tables, chairs, and even PCs to surf the internet. Bill Nanson: in Montalcino and Brunello the local tourist office will supply you with a list of all the wine producers, showing their location on a map, address and telephone numbers. Every small road junction has the brown tourist signs telling you which producer you will find down that particular alley. I chose some larger names to visit. Based on the experience of the producer where I was based (Barbi) which had a wine-tasting shop open most of the day and guided tours of the cellars several times per day mid-week, I expected a smooth journey. Altesino could see us only the next day, Frescobaldi (IGT’s Luce, Lamiaone and Brunello Castel Giocondo) were building a shop that would be open in another month, otherwise here was a card of a shop in Montalcino where to buy! Many had private road signs that I didn’t go down, only to be told later that I still could, plus some others who would only entertain trade professionals with an appointment. If you don’t know any Italian, I suggest patience and setting aside more than one day.